The Second Epistle to the Corinthians is a book in the New Testament, written by Paul the Apostle. Paul's most personally revealing letter, it portrays the great apostle as an embattled leader whose authority has been severely tested and who feels the need to justify himself by "boasting" of his suffering and sacrifices for the church. Writing after a second, "painful" visit to Corinth, Paul expresses pleasure that his emissary, Titus, has returned with a good report. However, Paul is fearful that when he comes again, problems will persist—ranging from challenges to his authority to sexual immorality in the church community. Paul also asks the Corinthians to renew their efforts to collect a donation which he plans to present to the church at Jerusalem. He apparently hopes to win the favor of the leading apostles there, who may have grown concerned about the fidelity of Paul's churches to their tradition. In the later chapters of the epistle, Paul bitterly denounces certain "false apostles," by whom the Corinthians have been influenced to doubt Paul's authority. Because these chapters differ so strongly in tone from most of the rest of the epistle, some commentators believe it is actually a later letter from Paul which was eventually combined with the earlier text. Several memorable verses come from 2 Corinthians, including "God loves a cheerful giver," and "where the Spirit of the Lord is, there is freedom." It also contains the account of Paul's vision of the "third heaven," the infamous "thorn" in his side which plagues him yet keeps him humble, and his so-called "meditation on immortality." Paul writes the now lost "warning letter," (see below) probably from Ephesus. Paul writes 1 Corinthians from Ephesus (1 Corinthians 16:8). Paul visits the Corinthian church a second time, as he indicated he would in 1 Corinthians 16:6, probably still during his three years based in Ephesus. This trip did not go well, and is described in 2 Corinthians 2:1 as a "painful visit." Paul writes 2 Corinthians, indicating his desire to visit the Corinthian church a third time. (2 Cor 12:14, 2 Cor 13:1) The letter does not indicate Paul's location, but it is usually dated after Paul left Ephesus for Macedonia (Acts 20), from either Philippi Thessalonica in Macedonia. Paul presumably made his third visit after writing 2 Corinthians, because Acts 20:2-3 indicates he spent three months in Greece after his stay in Ephesus. Also, in his letter to Rome, written at this time, he sent salutations from some of the principal members of the Corinthian church to the Romans. Paul, writing with Timothy, refers to himself as an "apostle of Christ Jesus by the will of God" and addresses his letter not only to the Corinthians but to "all the saints throughout Achaia." He defends his conduct toward the Corinthians and "boasts" of the clarity of his message (1:12-13), probably in contrast to other teachers. A sense of trouble between Paul and the Corinthian church lurks as he tells his readers: "it was in order to spare you that I did not return to Corinth" (1:23) and refers to an earlier "painful visit." 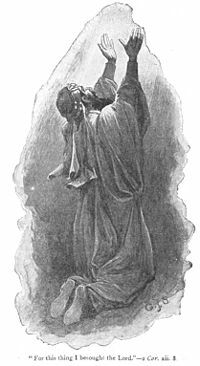 (2:1) He also refers to a previous letter which "I wrote you out of great distress and anguish of heart and with many tears." 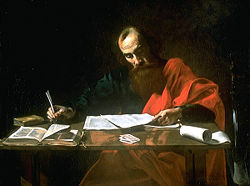 Although Paul is usually depicted as writing his own letters, most were probably dictated to a scribe. 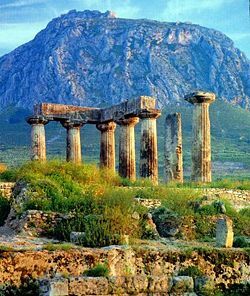 The Temple of Apollo at Corinth. 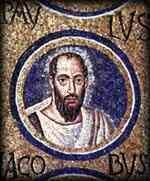 Paul was concerned that the Corinthians had not completely put aside pagan attitudes toward sexual morals. Returning to the theme of his personal sufferings, Paul lists such trials as "beatings, imprisonments... sleepless nights and hunger... dishonor, bad report... regarded as impostors... beaten, and yet not killed; sorrowful, yet always rejoicing; poor, yet making many rich; having nothing, and yet possessing everything." Having thus opened his heart to the Corinthians, Paul urges them to do likewise to him. The letter now returns to the theme of open-heartedness (7:1) and urges the reader to "perfect holiness out of reverence for God." Paul expresses no regret—then reverses himself and apologizes—for sending his previous letter, which he knows must have hurt. However, he is happy now, because of those who repented as a result. Also, Titus has returned to Paul with a good report of the Corinthians, who received him with respect and obedience as Paul's representative. Another abrupt change of mood and topic at the beginning of chapter 10 leads commentators to suspect another insertion here. Paul shifts to an angry and sarcastic tone, revealing raw and obviously still hurt feelings. Some believe this to be a later letter of Paul which was at some point combined with the "thankful letter" that precedes it. Another explanation for the mood shift is that Paul may have broken off from dictating the letter after chapter 9 and returned when he was in a different mood, possibly after receiving disturbing news of a new challenge to his authority at Corinth. In any case, the topic now shifts back to a defense of Paul's own character and authority. "Even if I boast somewhat freely about the authority the Lord gave us for building you up rather than pulling you down, I will not be ashamed of it," he declares (10:8). Regardless of the qualifications of these "superlative apostles," Paul insists, they cannot match his own credentials in terms of suffering for the sake of the Gospel. In the process of defending himself, Paul speaks revealingly of one of his own visions, in which he reports being carried away into the "third heaven" and seeing "inexpressible things." (12:1-5) Here, he also speaks of the famous "thorn in my flesh, a messenger of Satan, to torment me." Paul declares that this affliction—seen by some as a physical disability or disease and others as some embarrassing spiritual weakness—to be sent by God to keep him from spiritual pride because of his visions. Paul concludes by expressing a plan to visit the Corinthians "a third time." However, he fears that when he comes he will find many sins: "there may be quarreling, jealousy, outbursts of anger, factions, slander, gossip, arrogance and disorder. I am afraid... I will be grieved over many who have sinned earlier and have not repented of the impurity, sexual sin, and debauchery in which they have indulged." (12:20-21) He threatens hard punishment for the offenders: "I will not spare those who sinned earlier or any of the others." However, he hopes that when he comes, he will be able to use his authority to build up the church rather than to chastise its members who have sinned. He closes with a brief benediction. While there is little doubt among scholars that Paul is the primary author of 2 Corinthians, there is much discussion over whether the letter was originally one letter or a combination of two or more of Paul's letters, with some possible insertions by one or more other writers as well. 'The Warning Letter'—The sentence, "I have written you in my letter not to associate with sexually immoral people," (1 Cor 5:9) refers to an earlier letter, now apparently lost. Some scholars see fragments of the "warning letter,"—sometimes called the "strict letter"—in chapters 1-9 of 2 Corinthians itself, for example in 6:14-7:1. Others believe this section is not by Paul, since its attitude on purity laws seems to them to be contrary to Paul's theology. The Letter of Tears—This letter is referred to in 2 Corinthians 2:3-4 and 7:8. The majority of critical scholars believe that this letter must have been written between 1 Corinthians and 2 Corinthians but has been lost. Some think this may be 1 Corinthians but many commentators do not believe 1 Corinthians matches the description. Still others believe that a part of the "letter of tears" was combined with 2 Corinthians as the current chapters 10-13. This epistle reveals the personality of the Apostle Paul more than any other. Paul's deep affection for the Corinthian church is particularly evident, as are his hurt feelings over its all too apparent imperfections. In the process, Paul's own human weakness, sense of betrayal, self-vindication, absence of charity toward his competitors, and lack of diplomatic skills are clearly displayed—but no less than his ample spiritual strength, humility, willingness to forgive sinners who repent, and particularly his zeal for the spiritual welfare of the church of Christ and its members. Second Corinthians is also a rich source of information about the early church, much pondered by historians and textual critics alike. It has yielded some of the New Testament's finest verses, such as "God loves a cheerful giver," "the letter kills but the Spirit gives life," and "where the Spirit of the Lord is, there is freedom." ↑ 2 Corinthians: Introduction, Argument, and Outline, by Daniel Wallace www.bible.org. Retrieved November 10, 2007. ↑ 2.0 2.1 Corinthians, Second Epistle, Easton's Bible Dictionary, 1897. www.ccel.org. Retrieved November 10, 2007. ↑ Some scholars see a connection between the language of this section and the Dead Sea Scrolls, which call for a radical separation between believers and sinners. Others think it may be a fragment of Paul's earlier "warning letter." However, some critical scholars, as well as traditionalists, insist that such abrupt changes of subjects are not unusual for Paul, and that the issue of holiness may have been in the back of Paul's mind all along, as this was clearly a major problem in the Corinthians' church. This page was last modified on 23 January 2018, at 15:54.